EL VALLE GOLF RESORT will be the most exclusive Polaris development located between Banos and Mendigo, 10 minutes from the Murcia city centre and close to the beaches of the Mar Menor. The International Airport is merely a 40 minute journey from the resort, ensuring easy access to all main European cities. In addition San Javier-Murcia is only 15 minutes away. El Valle Golf Resort has been designed by top professionals with the aim to create an easy and enjoyable life, just imagine the best of everything presented in a singular setting. Only 688 homes will to be built within a closed perimeter on 1,100,000m2 on El Valle Golf Resort, creating an abundance of wide open space. All luxury villas and penthouse-style apartments will be built with different characteristics and will be centred around a splendid 18 hole golf course designed by Nicklaus Design. You will also find the club house, pro shop and driving range. El Valle Golf Resort is a place to enjoy nature and leisure. As well as close attention to architectural structures, the design of its numerous green areas has been designed by EDSA a leading US company in designing tourist complexes. Being a proprietor of one of the El Valle Golf Resort you can become a member of Polaris World and enjoy the fantastic facilities offered by all Polaris resorts in addition with full access to the Polaris Sports Centre. In El Valle Town Centre you will find all day to day amenities required within an authentic town setting. Choose great restaurants, an afternoon shopping spree or bathe in a heated pool these are just a few of the possibilities open to you. In addition there will also be a five star hotel with 150 rooms. In the El Valle Golf Resort Town Centre you will find endless services to make you feel privileged together with the peace of mind 24 hour security and CCTV gives you. El Valle Golf Resort has been designed to help you relax and enjoy moments of tranquillity in the company of your loved ones. With the highest standards in quality, specification and world-class golf in mind. 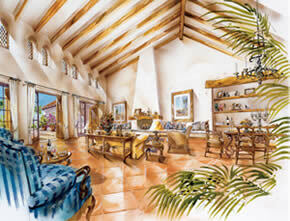 Nearly all properties at El Valle have now sold-out. Only a very small number still available.